When you have solar tubes installed, you not only get natural light, such as skylights can provide, but you also get a less expensive electric bill each month, including a less amount of hassles. If you are pondering the thought of having additional lighting in one room, hallway, or somewhere else, then you may want to consider installing solar tubes. With solar tubes, you can get more warmth, as well as more indirect lighting. How Do Solar Tubes Work vs. Skylights? How Do Solar Tubes Work? A solar tube comes in a 10 inch-diameter, and also in a 14 inch-diameter tube that has a polished interior and made of sheet-metal. These are also known as light tube, tubular skylight, sun tunnel, and sun tube. It channels light through the entire length and at the same time preserves the intensity of the light, with the interior acting as a continuous mirror while capturing the daylight on your roof, and carrying it to the inside of your home. The solar tube on your roof captures light through a plastic globe that’s weather-proofed. Then, there is a tube that runs into the room below through a porthole, which diffuses into the portal that’s built into the ceiling. The globe on the roof collects the outside light and is dis-fused or spread as a pure white glow. It gives a dramatic effect, in fact, homeowners that have had these installed have went so far as to reached without thinking as they are leaving a room, to turn off the lights. Skylights work in the same way the windows in your home work. Skylights are basically a window for your roof. Some skylights even offer open and close features that allow you to open the skylight window a few inches. 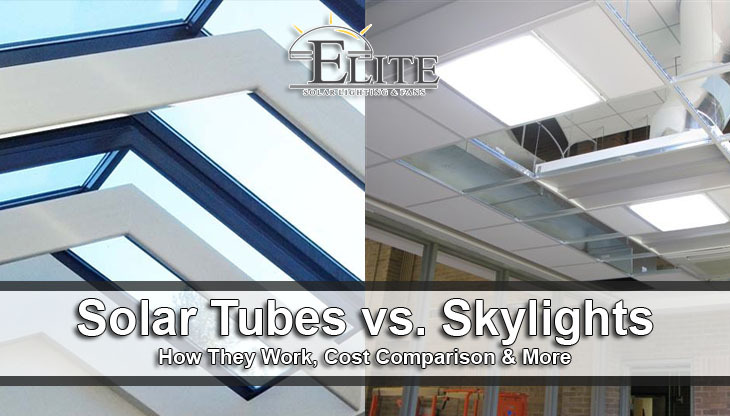 How Much Do Solar Tubes Cost vs. Skylights? How Much Do Solar Tubes Cost? A tube of light can cost anywhere from $450.00 dollars to $1,300.00 dollars if professionally installed, and this is compared to over $2,000.00 dollars for the installation of a skylight. However, if you are someone who is pretty good at handyman work and feel comfortable while upon a roof, installing the light tube yourself is an option using a kit that will only cost between $200.00 dollars and $400.00 dollars. The great thing about that is that a light tube does not require having new drywall, alterations to the homes frame, or paint. How Much Do Skylights Cost? Skylights (Fixed) – The average cost of installing a fixed skylight including material and installation cost is around $600-$1500 depending on how big you want the skylight window. You should always speak with a skylight contractor before selecting what type of skylight you want because the size cannot exceed over 15% of the floor area in the room. Also, an experienced contractor will let you know if you should add UV protection depending on the angle of how your skylight needs to be installed. Skylights (Vented) – Electric or remote controlled skylights will cost about $1,00-$5,200 including material and installing costs. Furthermore, you might also need to hire an electrician to take care of the wiring if the skylight contractor doesn’t have one already. How Much Light Does A Solar Tube Produce vs. Skylight? How Much Light Do Solar Tubes Produce? The littlest option available is the 10-inch tubing, and it is equivalent to 3–100 watt light bulbs, which is plenty for illuminating an area up to 200 sq. ft. Then there is the 14-inch tube, which has the ability to illuminate up to 300 sq. ft. However, about the only place you may not want to have a light tube would be above a television or computer, as the glare might be too much. How Much Light Do Skylights Produce? Traditional skylights cannot produce as much light as tubular skylights because they use a skylight well. Solar tubes don’t use a skylight well and won’t lose as much light through absorption like skylights do.Furthermore, traditional skylights don’t use light diffusion or diffuse reflection like solar tubes do. Light diffusion helps spread the light out over the entire room vs only shining down on areas where the sun directly shines through. Can You Install Solar Tubes In A Multi Level Home vs Skylight? Can You Install Solar Tubes In a Multi Level Home? You can still use solar tubes to bring light to the first floor if you live in a 2 story house. If your home has a mechanical chase or even a closet to which a tube could be ran through, that would let you channel the light down to the first floor of your home should it be a two-story house. On the other hand, should you have to cut through flooring or have other issues come up, such as plumbing, wiring, HVAC ducts, and etc., things could get complicated really quick. Can You Install Skylights In A Multi Level Home? Skylights on the other hand cannot bring light to the first floor because there is no tube to let the light travel through like solar tubes. Skylights can only be installed directly above the floor of the home where you want the light to shine in at. You could install them on a 2 story house but the light will only make it to the second story. Is Your Home Right For A Solar Tube vs. Skylight? Since the installation don’t need alternations to framing, there is not many limitations as to where you will be able to locate your light tube. Remember and check the attic, ensure there’s enough room or you to do a straight run. However, should you come across an obstruction, you can always use elbows and/or flexible tubing to go around it. Vaulted ceiling makes it easy to install light tubes as you will only need 12 inches off tubing (take or give an inch). Living in an area that has high humidity can cause condensation to the interior of the tube can cause issues. You can cut down on the amount of condensation by wrapping the tube up using (R-15) or (R-19) insulation. There are a few manufacturers who provide sections of tubing that have small fans built in to them to help in removing any moist air. Anyone living in an area that is prone to hurricanes can opt to have an extra hardy dome made of poly carbonate. You will get the best results from your globe if it is mounted on the southwest side of the roof. In choosing the spot where to run the tube is required to make sure that it is 14 feet in length, or less. I you place the globe right above the target room, it could convey up to 98% more exterior light. If the tube is able to twist and turn, you will get a minimal amount of light. The standard rafters should be spaced at 16” on center, and gaped enough to fit a 10” or a 14” tube. Should your homes rafters be spaced at 16” on center, they have available a special order for a 21” tube that has light coverage for up to 600 square feet. The kits have been designed having asphalt shingles in the idea, however, they also work well with shakes and/or shingles. With flashing adapters available to use for the metal or tile roofing’s. Many of the light kits will include flashing which is installed on roof having slopes that range between 150 (having a 3” 12 pitch) or a 600 (a n20” 12 pitch). Installing a skylight on the other hand will require alterations to framing and there are limitations of where you can install a skylight. Furthermore, traditional skylights take up more space and only allow for installation on parts of your roof that have plenty of room. Solar tubes are much small and can be installed in the multiple places on your roof. Elite Solar Lighting & Fans offers residential and commercial solar tube installation services throughout the entire united states, including Arizona, California, New Mexico, and more. Can You Install Solar Tubes In A Multi Level Home vs Skylight?, How Do Solar Tubes Work vs. Skylights?, How Much Do Solar Tubes Cost vs. Skylights?, How Much Light Does A Solar Tube Produce vs. Skylight?, Is Your Home Right For A Solar Tube vs. Skylight? What would be a ball park material cost for a 2’x2′ openable skylight with flashing for 15 degree slope? What Are Solar Tubes or Tubular Skylights?